My cousin posted a link to "The Country Cook's" Stuffed Pepper Soup recipe, and I was immediately intrigued. Below is simply a video to demonstrate what is written on the website, and below that, I have added my tweaks in italic alongside the recipe. 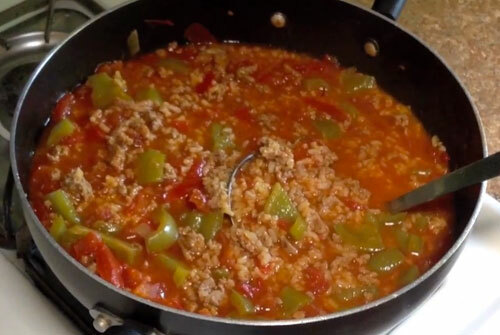 - Get a large pot, and brown your ground beef or turkey, as well as the along, with chopped bell pepper and diced onion, over MEDIUM-HIGH heat. - After it is cooked, drain excess grease from the mixture, then return it all to the pot. - Add in diced tomatoes, chicken broth (or beef broth), and tomato soup (or tomato sauce). Stir thoroughly. - Now add in the COOKED rice, and stir it all again. - Lastly, add your remaining seasonings: the sugar, the garlic powder, and your preference amount of salt & pepper. - Cover and let soup simmer on LOW-MEDIUM heat for about 30 minutes, to allow all of the flavors to blend. - Distribute into bowls, then top with the cheddar cheese, if you like!